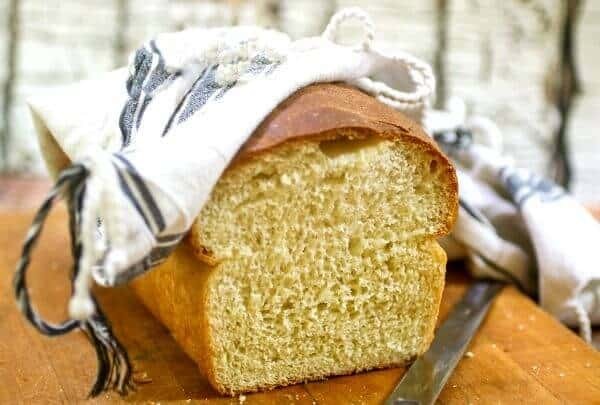 For this buttermilk bread recipe you’ll need: yeast, powdered ginger, sugar, buttermilk, honey, salt, baking soda, bread flour, unsalted butter. 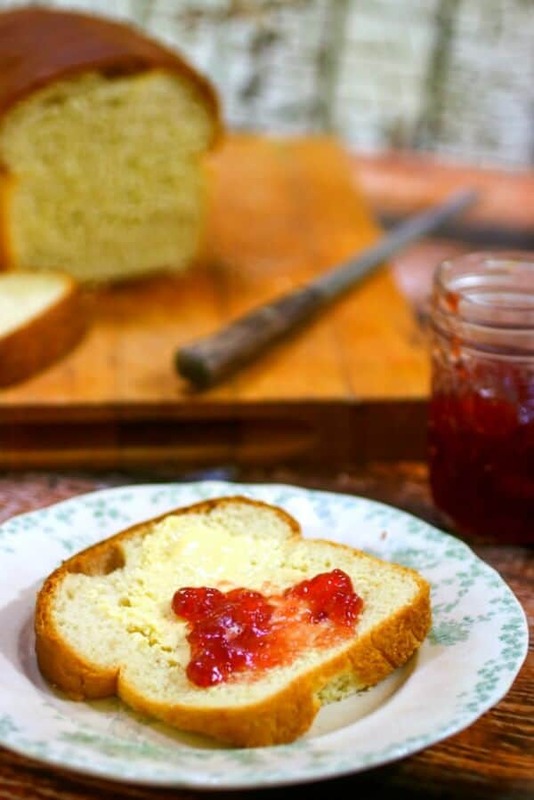 If you don’t happen to have buttermilk try the Amish White Bread — It’s a very similar recipe! How do I know when the bread is done? What Is Buttermilk and Why Use It? This buttermilk bread recipe is so unbelievably light that it doesn’t seem like homemade. It’s sweet but not too sweet so it makes a great sandwich no matter what the filling is. You can taste the honey but it’s just lightly sweet; not overpowering at all. I was lying on the couch one day, paging through a Seventeen magazine and they had a recipe for bread. I don’t know if they still publish recipes but they used to. I was bored, it seemed like a cool 70’s kind of thing to do, and why not? After all, the early 70s were all about artisan and handcrafted things. So I did it. I just followed the directions and there it was. It was magical. The house smelled great and I had accomplished something I had never seen or done before. I’d never had homemade bread. Honestly, it was one of those moments that changed my life. It was an epiphany and would more or less guide my food life from that moment on. The result was delicious — I was hooked. In fact – so hooked that I have made hundreds of bread recipes since then! Old fashioned, homemade buttermilk bread rises high and light with a fine crumb. Say “yeast bread recipe” and most people get intimidated. Making homemade bread is a skill that few people take the time to learn these days. Well, there’s nothing scary about it and it’s actually a lot of fun! Here are some tips, tricks, and tools to help you get over any fear you may have so you can create gorgeous loaves of bread like these! Easy honey buttermilk bread hot from the oven! Brush the tops with butter to keep the crusts soft. You can use an insta-read thermometer if you like. Push it into the side of the loaf – the center of the bread should be about 200F. You can also turn the bread out and tap the bottom. It will sound hollow. Real buttermilk is a thing of the past. It used to be the liquid that was left after churning butter but now it is a combination of skim milk and other ingredients with a culture added — something like yogurt. The acids that form are what helps give this honey buttermilk bread its fantastic texture. I like making my own. You can buy the starter online or you can use a little of the commercial buttermilk to start it. Yes, you’ll still get some of those icky ingredients but the amount is comparatively minute. Here is the post on how to make buttermilk if you haven’t seen it before. It’s so easy and you’ll be amazed at the difference in your baked goods. . This old fashioned white bread is so easy! When the yeast gets foamy it means it’s alive and ready to use. Add more flour until the dough pulls away from the sides of the bowl. Turn out onto a floured surface and knead. Place in a greased bowl…cover…and let rise. 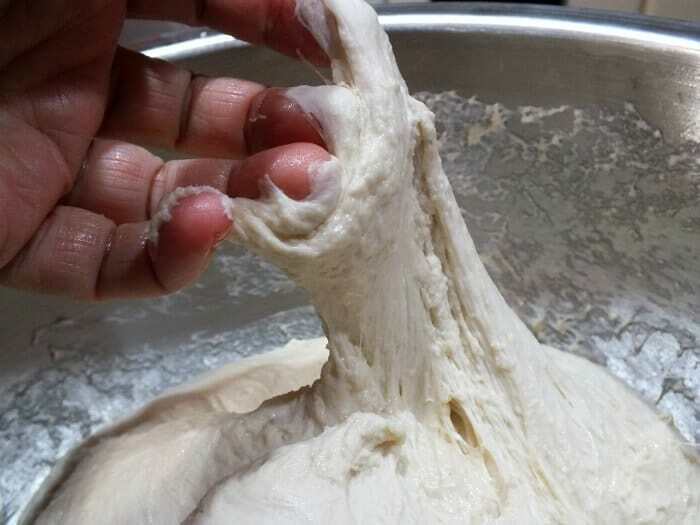 The dough has risen if it leaves a dent when you poke your finger into it. 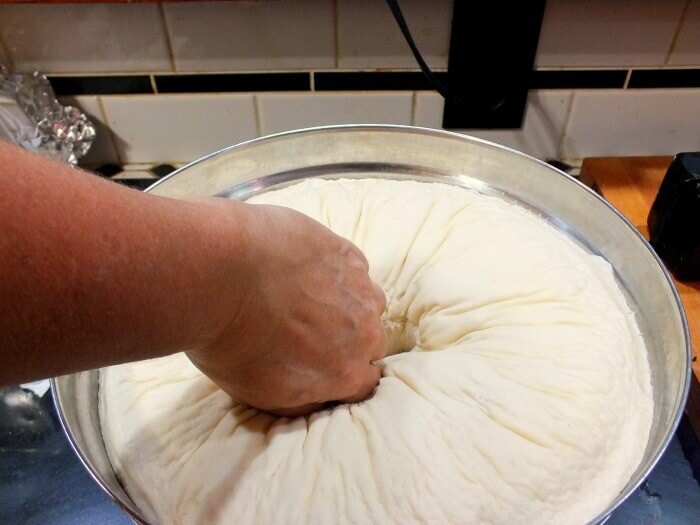 Let the dough rest for a few minutes after punching it down. A lot of people have asked me how to knead dough for homemade bread without a mixer so I finally did a video to demonstrate the process. Plan on it taking you 10 to 15 minutes to knead by hand. You can see an instructional video on how to knead bread here. 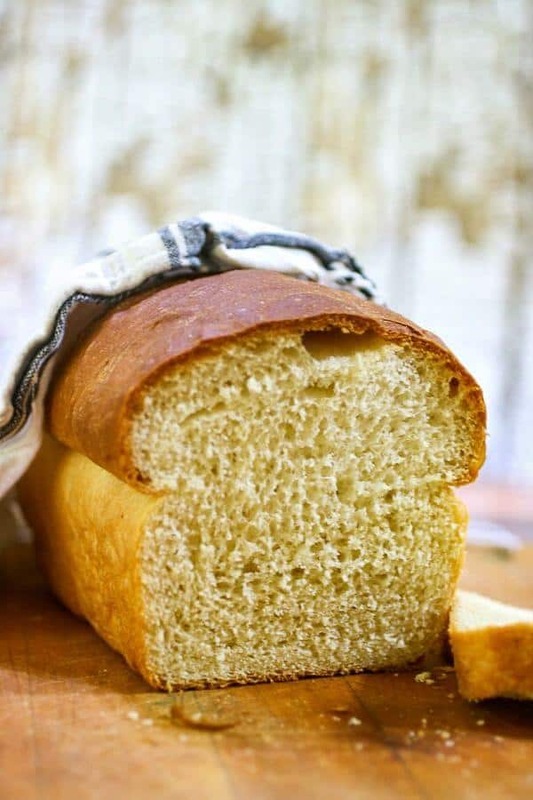 Many of you have asked about making this honey buttermilk bread in a bread machine. One reader, Debbie, did so and she left this comment. I thought it might help. shape put in greased bread pans cover and let rise for 1-2 hours and bake at 400 degrees for 30 min. I have nerve damage in my hands and this allows me to have this wonderful bread. [No need to] buy store bought bread ! I did not alter the recipe. This is not a problem here in Texas – at least not in my area! However, King Arthur Flour has some great tips for high altitude baking on their site. The information about bread and yeast is at the bottom of the page. Basically you’ll need to decrease the amount of yeast in the recipe so if it calls for 1 tablespoon yeast you’ll want roughly 2 1/2 teaspoons of yeast instead. You’ll follow the recipe but more than likely you’ll need to adjust the amount of flour you use to get the right texture – it may take a couple of tries. Also your rising time will be MUCH faster so keep an eye on your dough! I’ve written a series of posts to help with questions about yeast baking and troubleshooting problems you may experience. Be sure to take a look before getting started. 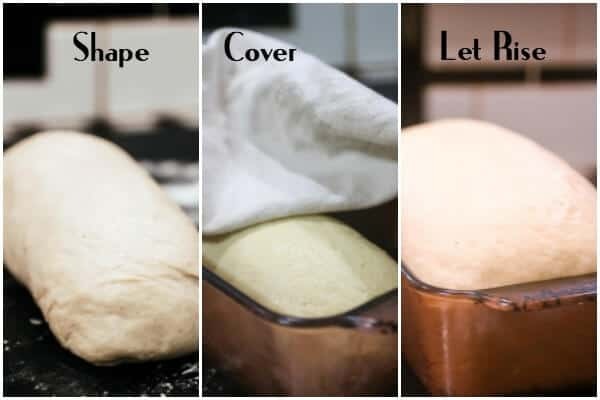 Also – these tips on getting your bread to rise properly are what keep my breads high and light! Be sure to check out the essentials for success page to find links to the tools and ingredients I use most often in my baking. If you’ve wanted to learn to bake bread but it never comes out quite the way you think it should… you might like my book, Bread BootCamp. It’s gotten great reviews! 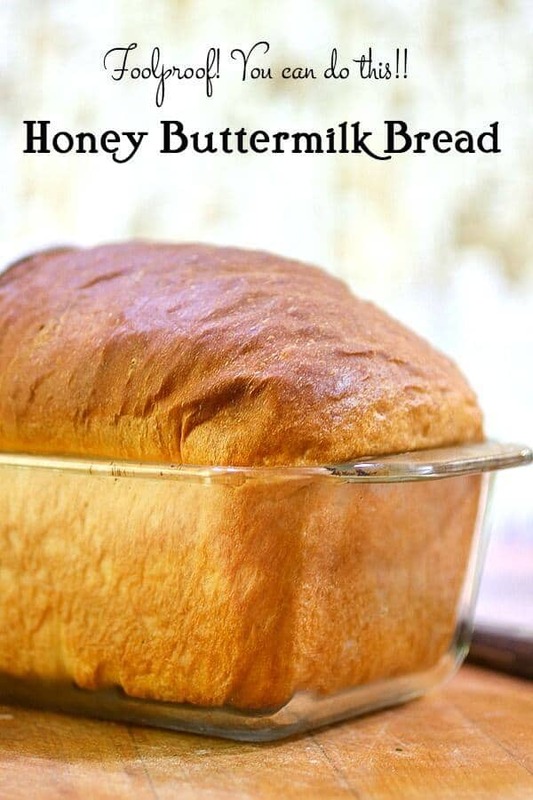 Not only does it contain this honey buttermilk bread recipe, there are recipes for batter breads, cinnamon rolls, whole wheat bread, and many more! Bread Bootcamp is available on Amazon for Kindle or in paperback. You’ll find more great products for your bread baking adventures in the Restless Chipotle & Co. Storefront! I make bread a lot – I just love the process! Here are more of my favorite recipes – which is your favorite? This soft white bread recipe has a fine, even crumb. So, here’s the honey buttermilk bread recipe! I really think you’ll love it – it’s the best bread ever! So many people have made this yeast bread and told me it was their family’s new favorite. Are you a fairly new bread baker? 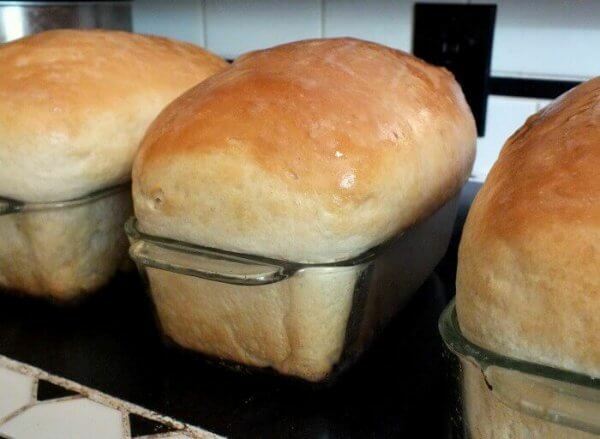 Read this post on how to make homemade bread first. If you like this recipe please give it 5 stars! 1 tablespoon/packet yeast, I usually use 1 because I buy in bulk. 1/4 cup unsalted butter, melted and cooled so that it is warm to the touch but not hot. 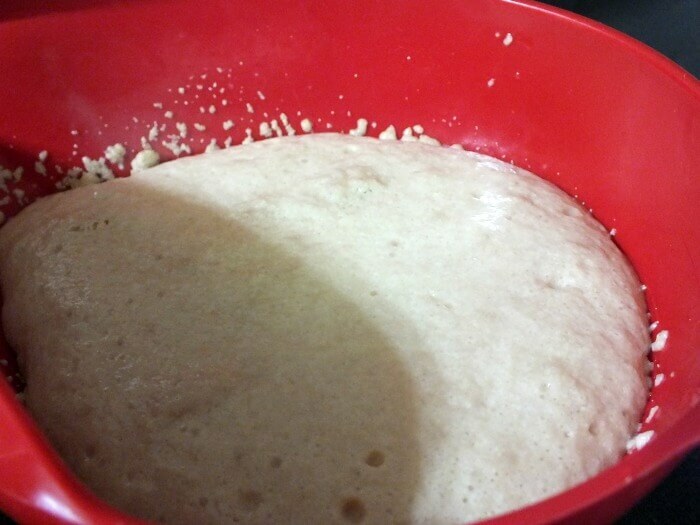 In a medium sized bowl mix the yeast, ginger, sugar, and warm water. Set aside for 5 minutes or until foamy. Whisk the buttermilk, honey, salt, and baking soda together and add it to the yeast mixture. Add three cups of flour and mix until smooth, about 3 to 5 minutes on low of a stand mixer. Pour in the butter until it is totally mixed into the batter. Add the rest of the flour, one cup at a time, keeping mixer on low speed. 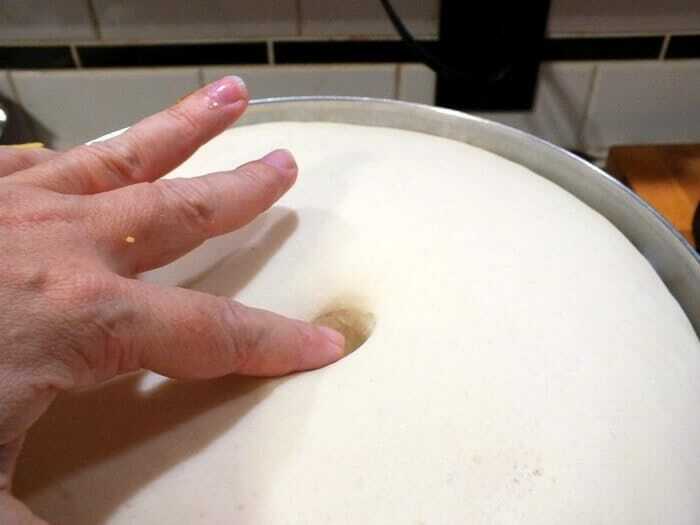 When dough pulls from the sides of the bowl remove it from the mixer to a lightly floured surface. Knead until elastic and smooth. You can also knead in your mixer according to manufacturer’s directions. Place in greased bowl, turn to grease the top, and cover with a clean tea towel. Allow the dough to rise for 1 1/2 hours, or until double. Punch down and form into two loaves. Place in greased loaf pans and grease tops. Cover, and allow to rise for 45 minutes, or until it is just about to the tops of the bread pans. Bake for 30 minutes. You can cover the tops with foil if they brown too fast. Remove loaves from oven and brush with melted butter. Allow to cool in pans for 10 minutes. Gently run a knife around the edge between the bread and the pan to loosen it. Turn out and cool completely on a rack. Cover the loaves if you want soft crusts. The baking soda does two things… It works with the acid in the buttermilk to help the bread rise high and light and balances any off tastes from the acids in the buttermilk. I'm so glad you tried the recipe! Upload your image so everyone can see what a great job you did... I'll approve it as soon as I can. Hi! When using the bread maker for dough mixing purposes ONLY, do I mix the ingredients according to the original directions (letting yeast rise, then mixing etc..) or do I just put everything into my bread mixer in order given under your friends directions for when mixing AND baking in bread machine? I haven’t made this but planning on it over the weekend. And it will still be good after thawing? Homemade bread only stays fresh a couple of days. You can freeze it… what I like to do is slice it, put parchment paper between the slices and freeze… that way I don’t have to thaw the whole thing. Sorry for all the questions but when I’m trying something new I try to do my research. I read (after I messaged you) that it is better to freeze the dough after the first rising in the pan. What do you say? Also could you leave the dough in the fridge overnight? It is best to freeze after the first rise, thaw overnight,shape it, and let it rise again before baking. 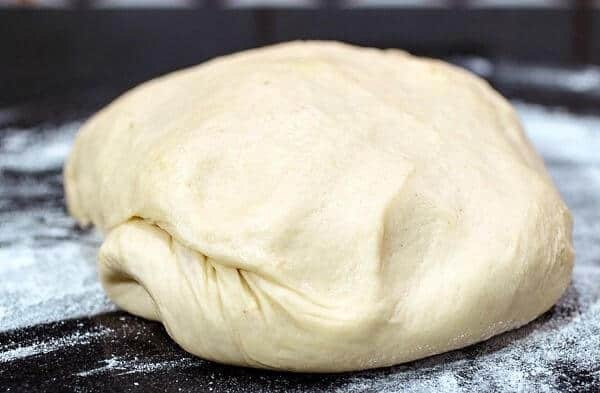 You can leave the dough in the fridge overnight and it’s fine – you might just add a pinch more yeast and sugar. Sourdough srarter, WOW, turned out Great!! Best rise, and such a great taste!! Thank you. Now have your book too!! I see a lot of baking in my future!! Thank you so much!!! It’s definitely my favorite! My wife is so amazed at me. Your bread recipes are so easy to follow. I am on the good list for now thank you. This bread tastes amazing!!! Ridiculously good. I made it without the ginger. It was a huge hit. Made the dough, allowed it to rise for an hour and then put it away in the refrigerator till evening. Wanted to bake it for dinner. Took it out two hours before baking, got it to room temp, shaped it, allowed it to rise,for an hour,baked. Hey presto warm bread for dinner. So glad you liked it. 🙂 The ginger is just to help activate the yeast. This quickly became my favorite recipe and has us quite spoiled thank you for making this so easy to do. I was not so good at bread however your recipe changed that. I would encourage any first timers to use this recipe it will make it simple and very proud of your abilities..
Love love love it!! Just searched my history for this recipe because I didn’t bookmark it when I made it. This will be the only recipe we use from now on. I had no problems with it browning, and didn’t have to/ will not make changes to the recipe. Thank you for an amazing recipe!! Hello! I just wanted to start off by saying that you absolutely inspire me. Thank you for sharing your time and talent to make the world a better, more-homeade-bread-filled place 🙂 I do have one question that may sound a bit funny: would you say the dough yielded in this recipe would be approximately 2 pounds? I collect vintage Pyrex, and recently came across a baking tube at a yard sale. I love baking homemade bread my loaf pan, but the thought of cylindrical loaves and circular slices intriguies me! The tube says to use a 1lb-1.5lb batch of dough, and before I whipped out my (not always so reliable) kitchen scale, I figured I would ask the professional! Thank you again, hope you’re having a wonderful 2019! Tricia you are too sweet! Thank you!! I think this is for 2 to 3 pounds…so it should be fine if you half it. After following the recipe exactly and getting what i considered overdone results i tried some changes. I added 1 t ginger instead of a pinch and was generous with the honey. Also left out the soda. Third change was reduce the baking temperature to 350. I have a moist , flavorful and not overbaked bread. My ovens are right on temperature so thats not the issue though i am at 4300 ft elevation. For me,,, and i do bake almost all our breads,,, the third time was the charm. I definitely will try this! But I have a question! Normally when a recipe calls for buttermilk, I substitute 1 tbsp of vinegar to a cup of milk. Will this work for this recipe as well? I don’t care for it done like that but it should work. Very forgiving recipe! I made a few errors like the buttermilk was too cold, the kitchen wasn’t very warm, perhaps over-kneaded it with my Kitchenaid…and it still turned out well. I did the second rising in quite a warm oven and it seemed to work! I like that the bread is substantial but not heavy. Thanks for sharing this recipe and your goldmine of information!! It works with the acid in the buttermilk to help the bread rise high and light and balances and off taste from the acids in the buttermilk. This is an outstanding bread recipe. I am in the process of making this for the 2nd time. I did not have to use foil. I baked it on the 2nd rack from the bottom. I baked one in a glazed ceramic loaf pan, and the other in non-stick metal and both turned out great. The last time I made it, I froze one loaf after it cooled and when I was ready for it I just popped it back in the oven at 375 again until it was heated thoroughly. Everything you make, Marye is outstanding! Love your recipes! Can I use half whole wheat flour or cracked wheat flour in this recipe? I just ate my second slice, right out of the oven. This is a great bread recipe. I followed the recipe to a T. I mixed it in my Kitchen Aid mixer using a dough hook for the full mixing process. I used Busy Bee Honey, so nothing too strong. I LOVE honey, but my husband doesn’t care for it so I didn’t want it to overpower the bread. I’ll definitely make this again. I plan on slicing it up tomorrow for grilled cheese and bacon sandwiches. I also have been making bread for about 40 years. I had left over buttermilk and fresh honey from an orchard so am making this right now. I love to knead by hand. It reminds me of watching my Busia make bread when I was very little. Thanks for the recipe. Hi. Can I substitute the bread flour with AP flour or self rising? So for the buttermilk is it just the liquid left over from churning heavy cream into butter? Or do I need to culture it? Going to give this a shot this weekend. I’ve made this three times in two weeks! So yummy! Would it be possible to do half the flour with whole wheat? Yes! I’ve done that. Just add an extra tablespoon of gluten flour. I recently tried this recipe with gluten free flour. Wasn’t as light and fluffy as I wanted. Any suggestions? I think all bread makers have a favorite recipe and I was no different until this past week. My go-to, no-fail white bread recipe just wasn’t turning out good loaves. My ingredients are fresh and nothing changed. They just wouldn’t bake properly no matter what I tried. 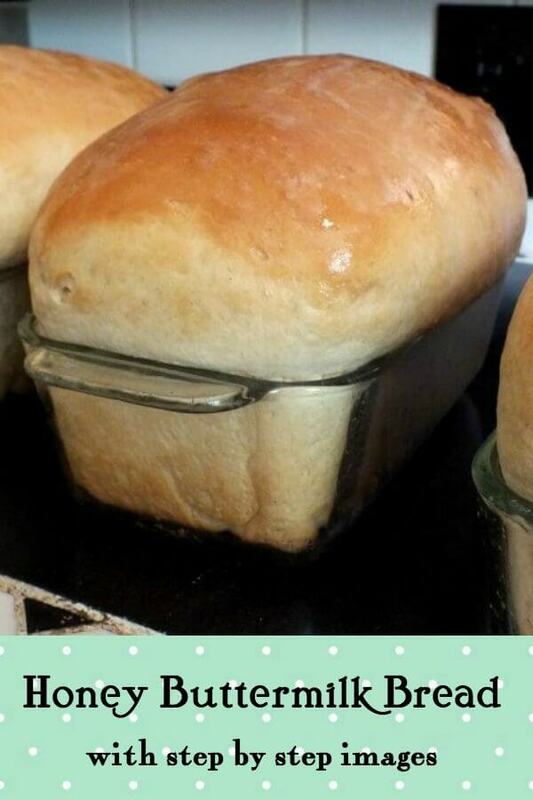 So I took to Pinterest having already decided I wanted to find a buttermilk bread recipe (I’m blaming hormones). I am SO GLAD I chose this one. I have two glorious loaves of amazing bread. Well, one-and-a-half. They haven’t cooled completely and we’ve already polished off half a loaf. The rest may not make it through the night. My loaves are pretty dark because the foil would not stay put but they are still soft thanks to butter and bees wrap, and perfectly done inside. Thank you so much for saving me this week. I think I’ll be keeping this as my go-to bread for quite a while! I’ve found that 375 for an extra 10 minutes works just fine without foil. Perfectly brown crusts and a tender crumb. The whole family gives this two thumbs up.